The Forrest Yoga Guardians are hand-picked by Ana Forrest and serve as Guardians of the legacy of Forrest Yoga and mentors to the Hoop of the Teachers. Each Forrest Yoga Guardian has gone through extensive training with Ana to learn the skills required to be a mentor for teachers. 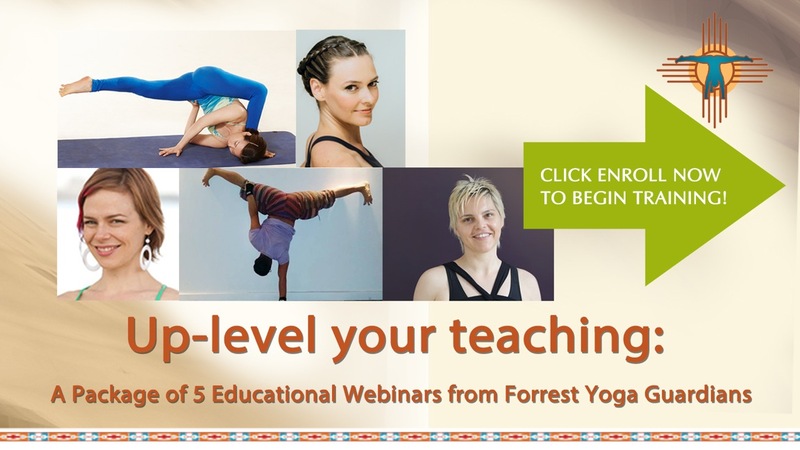 In these hour-long webinars you will have the chance to learn from the most experienced teachers of Forrest Yoga. Each Guardian will share one of their specialties with you – broken down into practical pieces that you can implement immediately into your own teaching or training. These webinars will allow you to deepen your skills and knowledge in order to serve your students on a more profound level. Abdominals are an integral part of Forrest Yoga: they strengthen the core, get us connected to our center, heat us up and they most definitely get us out of our head! However, as teachers of Forrest Yoga, cueing abdominals can be the hardest and most challenging part in terms of getting the wording right. This webinar looks at bringing a little order into the jungle of abdominals! We will look at what kind of abdominals there are, how to cue them, in particular when to cue holding the breath and when not, and how to sequence them. Upleveling, downleveling and modifying abdominals will also be part of this webinar. We do them, we cue them, we even have to attempt to explain to practitioners from different traditions as to why we go on about them. This webinar will begin to discuss the anatomical and psychological references to the physiology AND magic hidden behind each of these basic moves. You will learn some examples that give solid reason as to why we practise the basic moves, and learn to deliver them in a way that practitioners feel empowered by taking your cues. Curious about the body positivity movement? Wondering how Forrest Yoga fits in? Wondering where YOU fit in? This webinar will go over current events and issues, and itemize the ways that Forrest Yoga promotes body positivity, and the places where we (and all styles!) could grow. Leave with clarity on all these ideas and inquiries. Learn what kind of empath you are, and how you best receive information. Deepen your skillfulness in feeling, digesting and sorting information so you can trust and act on your intuition more quickly. Recognize the signs that ​you are depleting your energy (or letting an​other's energy deplete you). Discover the five best ways you can support yourself as an empath. Get tools to uplevel your teaching (including running energy or pulling it out, speaking what's true and "uptaking the sweetness" so you can feel nourished by your teaching and your life). Sinhee is thrilled to have an opportunity to share her knowledge and experience of 15 years in teaching private clients. Planning and teaching private classes can seem a challenging prospect, but provide such a rewarding teaching and learning experience. Sinhee will speak about the preparation of teaching private classes and also give tips on how to best approach sequencing and poses for beginners. To Purchase Any of These Webinars Individually, Please Click This Link.